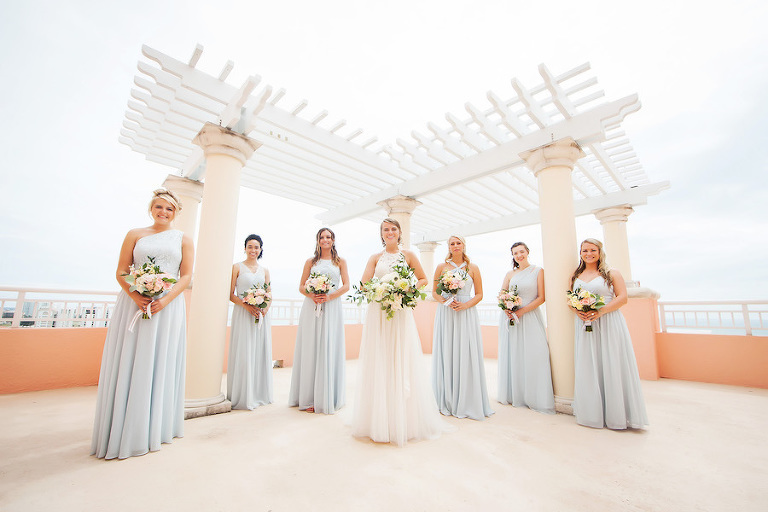 The Hyatt Regency Clearwater Beach is a one-of-a-kind waterfront wedding venue that offers amazing multiple locations to host not only your ceremony, but your reception as well. 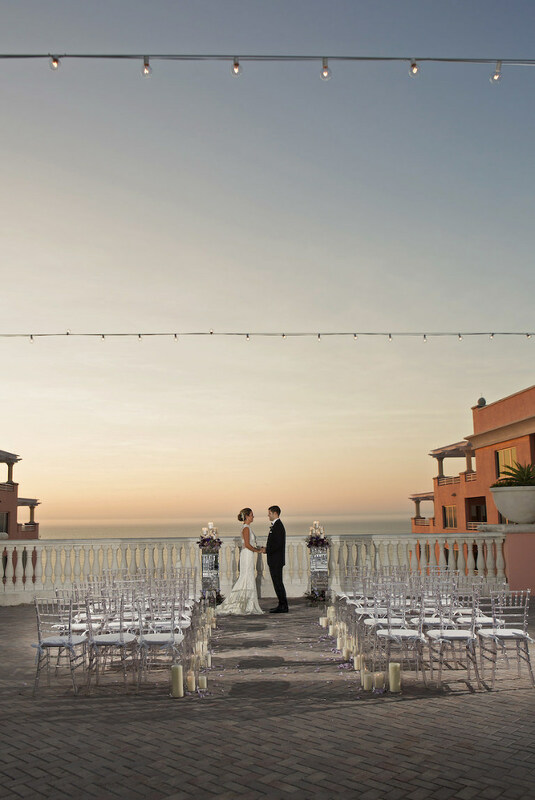 The hotel’s rooftop deck, the 16th floor Sky Terrace, overlooks Clearwater Beach, the Gulf of Mexico as well as the intercostal, and serves as the perfect setting for an outdoor ceremony or reception that will give you the beach, without the sand. The newly renovated Belleair ballroom and terrace offers floor to ceiling windows and a private deck that can accommodate up to 140 guests. The gorgeous Caladesi Room and Terrace, located on the 8th floor of the hotel (which is currently being renovated), is perfect for a reception style event up to 200 guests or an intimate wedding ceremony and reception for up to 40 guests and boasts views of Clearwater Beach and the Gulf of Mexico. For a larger wedding with up to 225 guests, the Aqualea Ballroom offers 15-foot ceilings with grand chandeliers. Each guest room is a condo style layout offering fully-equipped kitchens and private balconies, ranging from a comfy 575 sq. ft up to 2 bedroom/3 bath, 1600 square ft suites. Surprise Proposal at the Hyatt Clearwater Regency. from Hatfield Productions on Vimeo. What three things do you love most about your venue? 1. The Sky Terrace. 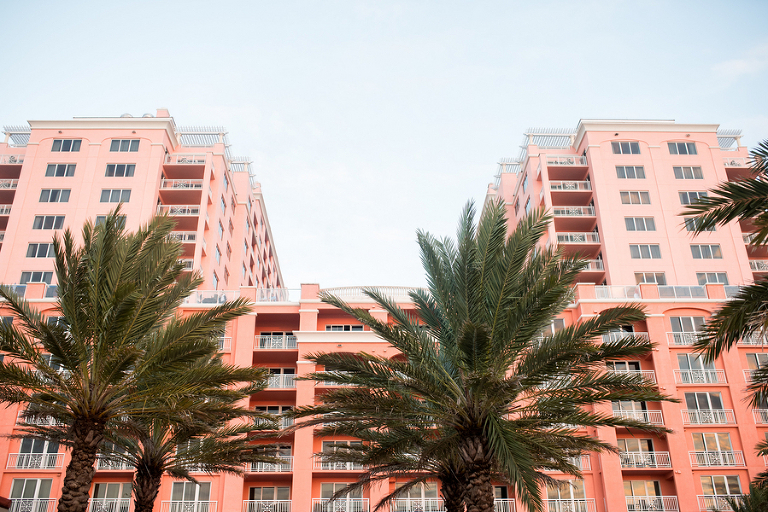 It is truly one-of-a-kind location with breathtaking views of the Gulf, the beach and the intercostal. There is no where on Clearwater Beach that can even compare. 2. The Belleair Room. Waterfront ballrooms are hard to come by and with the modern touches throughout the space it is incomparable.Our newly renovated indoor/outdoor ballroom, with floor-to-ceiling windows, can accommodate up to 140 guests and will provide any couple the perfect location to host the day of their dreams. 3. The staff. You will be treated like the royalty you are on your wedding day! Our staff is spectacular and will make you and your guests feel like they are home, without a care in the world. 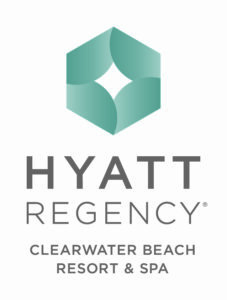 How does the Hyatt Clearwater Beach make the planning process easier for couples? We have an Event Planning Manager who will be your point of contact throughout the planning process and will be with you on your wedding day. Their role is to ensure everything the hotel is providing and has planned is executed flawlessly and that your day is everything your dreamed of! What perks do your couples receive? What would couples be surprised to know about your venue? Most couples are surprised at how flexible we are when it comes to menu creation, customizing menus to fit budget and personalizing to each couple. What makes your venue’s cuisine stand out? Our wedding packages were created around the Florida couple to enhance your guests’ experience through cuisine and the menu that you choose for them. Our chefs are very involved in your tasting and can also customize a menu that can help personalize your menu, even further creating a unique experience that your friends and family will recognize. The flexibility in our menu and customizing to each client is something unique we offer that not many venues do. What is one of your favorite things about being the Hyatt Clearwater Beach’s wedding venue coordinator? One of the best things about being a venue coordinator is being able to share in each couples special day and seeing it all come together. From planning to execution, seeing the couple walk away with their wedding exceeding any expectation they had! 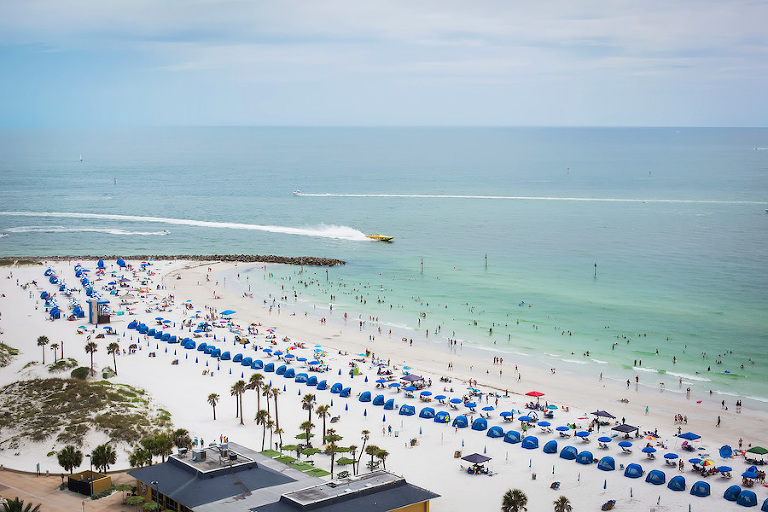 What is one of your most memorable moments at the Hyatt Clearwater Beach? I had a bride who lost her engagement ring while on vacation. We were doing a walk through, showing the groom the Sky Terrace for the first time, and he got down on one knee and proposed again with a new, bigger ring! She was floored and so was I! Chef Kory’s amazing food here at Hyatt and great music. What is the best piece of advice you can give to a couple who is searching for a wedding venue? Do not get overwhelmed! It is a lot of information and a big decision, but you will know what is right for you as a couple and to fit your vision and budget. Also, don’t let the sticker price shock you. If you provide a budget you are working with, many venues will try to work with you to make it work for you. Packages range in price between $140-$170/per person + 23% service charge and 7% tax. Each space carries a food and beverage minimum. The minimum is what you are required to spend in order to utilize the space, prior to tax and service charge. How you achieve your minimum is based on the number of guests and the menu you choose. Sky Terrace – Located on the 16th level overlooking the intercostals and the Gulf with breathtaking views. Aqualea Ballroom – This elegant ballroom is located on the 2nd floor and can accommodate up to 225 guests. This room features very neutral colors so you have endless possibilities when it comes to decor. $18,000 minimum for Saturday, $16,000 for Friday and $14,000 for Sunday. Sky Terrace – Located on the 16th level and can accommodate up to 130 guests. The Sky Terrace’s view is sure to take everyone’s breath away. $15,000 minimum for Saturday, $12,000 for Friday and $10,000 for Sunday. The Belleair Room – Located on the 2nd level, this room features floor to ceiling windows with breathtaking views of the Gulf of Mexico. Along with its adjoining terrace, this room provides the perfect setting for up to 140 guests. $15,000 minimum. Originally from Cleveland, Ohio, Lindsey Sikes graduated from Kent State University with a Bachelor’s degree in Business Management. Her favorite part of her role is helping her couples envision their perfect day at Hyatt Clearwater Beach. Having a role in their day, our team will be a part of their wedding memories forever and that is an amazing role to have in their lives. Lindsey has been with Hyatt fulfilling wedding dreams for over five years at Hyatt Clearwater Beach.